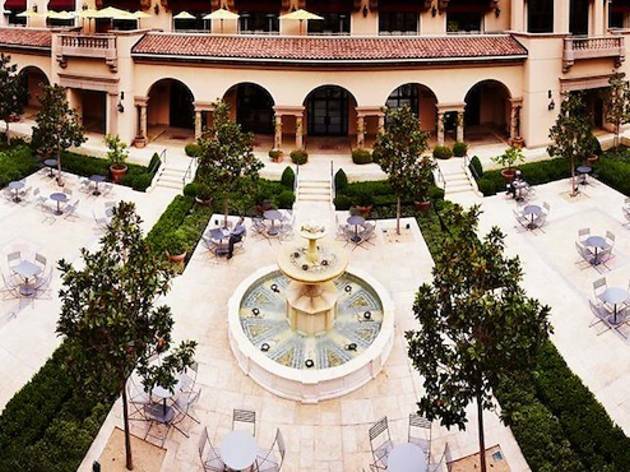 With spurting fountains, a gold cupola and a shrine-like 2-story spa, you’ll wonder if you’ve stepped into a remote Tuscan villa instead of a high-profile side street in Beverly Hills. Amenities are excellent, ranging from a mineral wellness pool decorated with gold mosaic tiles to a Geoffrey Zakarian fine dining restaurant—in short, a stay fit for a queen. A high caliber of service is what makes this moneyed stopping place so well known across the city. Everywhere you look, there’s opulence, from the rooftop restaurant to the 2-level spa, to the gold cupola crowning the top of the building. Since the twin objectives for travelers to Beverly Hills are to beautify and to retreat, it makes sense that the 20,000 square foot spa is one of grand exclusivity—L.Raphael Genéve, a Swiss brand, only has one other location in the entire country. All that pampering makes the hotel a fast favorite during awards season, when the elegant loggias, terraces and chic private dining rooms are transformed for elite industry events. For those who are just here to sample the scene, Geoffrey Zakarian’s classic American restaurant, Georgie, does a wonderful happy hour, with small plates of spiced popcorn, arancini and lamb sliders. The airy, Mediterranean-inspired design extends into the 201 guest rooms and 55 suites, with monogrammed pillows, rich oak furniture and marble bathrooms. While nothing here even approaches modesty, there’s always a spectrum, as evidenced by the most expensive accommodation listed on the site: a 3-bedroom residence equipped with a private elevator and a kitchen with fully stocked wine cellar. Location: Encircled by luxury retail shops in downtown Beverly Hills, the hotel is a well-connected hub for frequent excursions to the nearby designer boutiques and posh cafes. It’s 13 miles from LAX, and conveniently located near the 2, which leads up to West Hollywood or out to Santa Monica and the beach towns. Westfield Century City: Two miles from the hotel, this immense mall has a nice mix of high-end (Brooks Brothers, Swarovski), main-street (Gap, Sunglasses Hut) and boutiques like Aritzia and Compartes chocolatier. There’s also a 15-screen movie theater, a 3-story Nordstrom and an Eataly. The Getty Center: Eighteen minutes from the hotel by car, this iconic museum took 13 years and about $1 billion to build. The end result is a remarkable complex of travertine and white metal-clad pavilions with world-class art, along with a café, restaurant and gardens. Rodeo Drive: You won’t find much in the way of budget souvenirs along this mythical stretch of retail nirvana: Dolce & Gabbana, Gucci, Dior… they’re all here. There’s even a shopping mall designed by Frank Lloyd Wright. Spago: Everyone, at some point, when they’re in Beverly Hills, ends up at Spago, the internationally-inspired bistro by Chef Lee Hefter. Just off Wilshire Boulevard, the patio is a charming spot for dishes like pan-seared cod and handmade agnolotti. 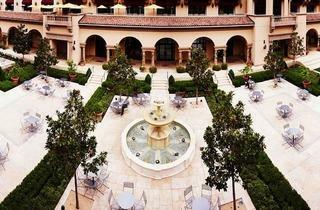 Good for: For any traveler looking to make a statement, a getaway to the Montage Beverly Hills speaks volumes. Wellness trips get a boost from time spent in the humongous spa—there’s also a superb gym if staying fit while you travel is a priority. Families, high-end business groups, and couples on their anniversary will make use of the hotel’s extensive amenities. Time Out tip: When you’re not making use of the gym’s extensive weight training and cardio machines, be sure to scope the monthly fitness calendar. Classes here are varied enough (Boxing Boot Camp, Body Sculpting, mat pilates) to rival your local Equinox, and there are several of them spread out over the course of each day to match up with your schedule. If your needs are really specific, the hotel will even go out of its way to book a private boxing or meditation session. The Montage is a spectacular place. Centered in the middle of Beverly Hills, this is a place to see and to be seen. When I came here, I saw Ryan Seacrest and Timberland within minutes of each other. It's packed with people staying there, eating at one of its many restaurants or just simply walking around. It's a must see place!